These tarts are one of my favorite dinner party desserts. They are delicious, incredibly easy to prepare, can be made in advance, and with a scoop of vanilla bean or cinnamon ice cream they strike the perfect balance between being elegant and also rustic and homemade looking (which is something that I am always striving for). You start by cutting rounds of frozen puff pastry, on top of which you place about a tablespoon of cinnamon sugar. Add a pinch of freshly grated nutmeg to each, and then top with three fresh apricot halves. Bake at 400º for fifteen to twenty minutes until the pastry has puffed, and is nicely golden brown. 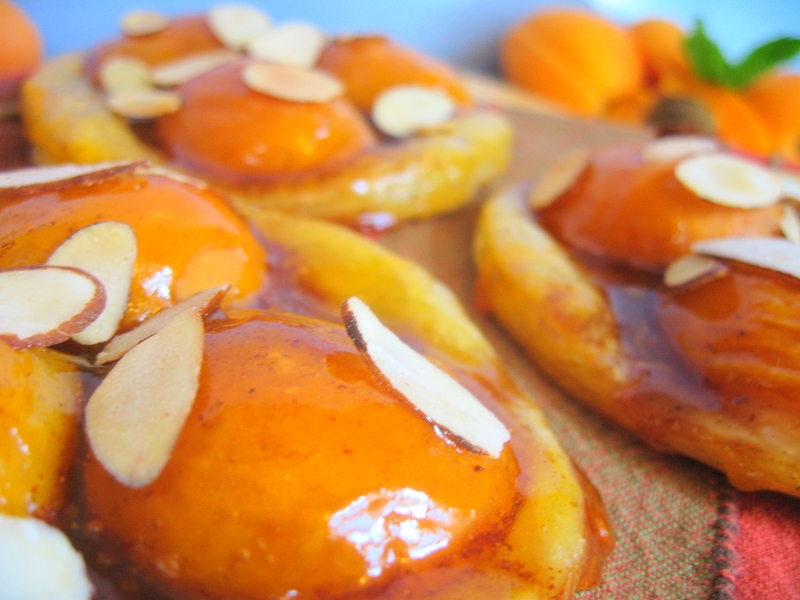 Brush the tops of the baked tarts with a generous amount of hot, strained, apricot jam (preferably homemade), and sprinkle with some lightly toasted, sliced almonds. 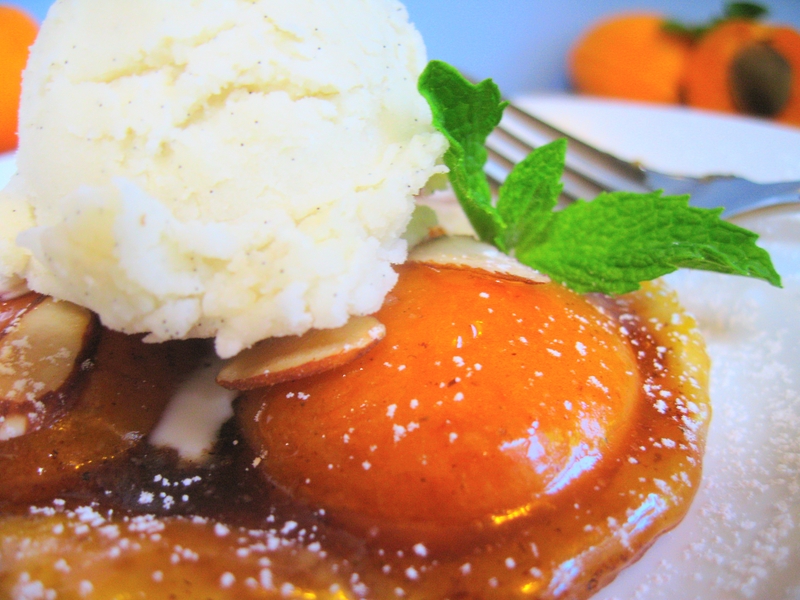 These tarts are beautiful, have the perfect amount of sweetness, and the interplay of textures between the flaky puff pastry, soft apricots, crunchy almonds, and creamy ice cream is magical. Everyone loves them, and no one has to know how incredibly simple they are to make. Enjoy! These are lovely, and would make a wonderful breakfast pastry, too. I have never thought of that before. But you are right. They absolutely would. =) Thanks for the idea! Those look so artistic. They look wonderful. Another steller recipe…and photos. Speaking of apricots…I found something interesting at the Fresh Market today…Black Velvet Apricots. Oh my…they color is amazing. They almost look like they bleed when you cut them because the juice is such a deep burgandy. They taste about the same as the orange flesh variety but they are amazing to look at. I can definately invision them as the crowing jewel on a fresh fruit tart. Wow. Who knew? I will have to keep my eye open for some of those =) Thanks for the tip! They look so simple yet full of fantastic flavor! I agree – great entertaining dessert!! Finally, a dessert I can actually pull off. 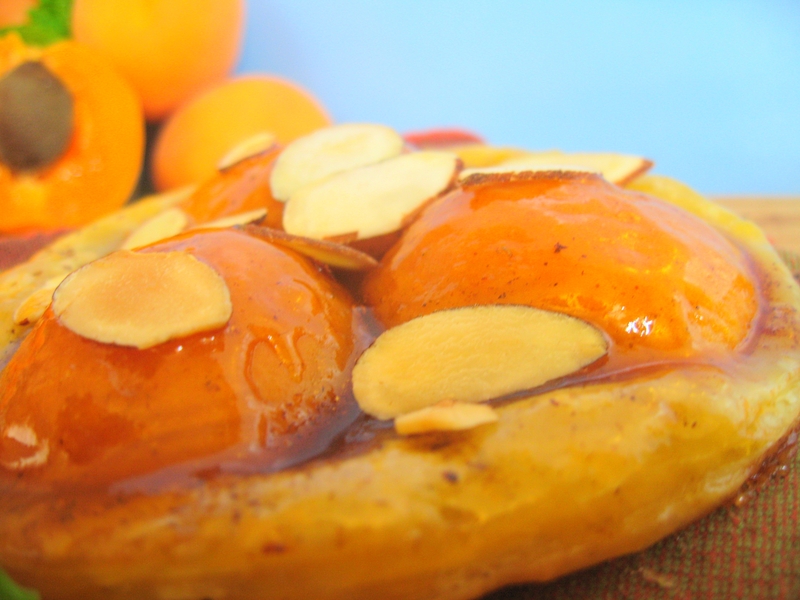 Apricots are a favorite in my house. What a great recipe you shared with us. Would love to try it very soon.